Ever get nervous before you send an email? You know – those final moments right before you’re about to click that final, irrevocable “send” button to several hundred or several thousand people? It’s a reasonable fear. We’re all human. We all make mistakes. Even proofreaders mess up from time to time. To help you get over that email-anxiety hurdle, we’ve put together a list of the ten worst mistakes you can make. Consider using them as a checklist in that anxious moment before you click the “send” button. 1) You don’t have peoples’ permission to send them emails. This one’s a big deal. It’s against the law even – both in the United States (under the CANSPAM Act and in Canada (under CASL). Get caught, and you could be looking at fines up to one million to ten million per email. But instead of freaking out over multi-million dollar fines, just don’t mail to people if you don’t have their permission. OK? Building an email list may not happen overnight, but it’s not that hard to do. Oh yeah – and you’ll get WAY better results with a home-grown list. 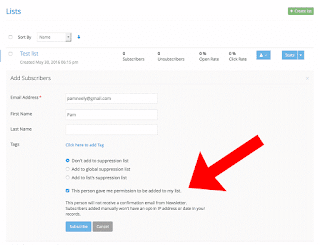 We will always check with you to confirm you’ve got permission to mail to someone. This benefits everyone – you, your subscribers, and us (because we want to keep our deliverability rates high for all customers). 2) Sending to a list from your personal email account. ‘Nough said? I hope so. 3) You didn’t send a test email. Let’s go back to that pre-mail moment. Are you worried there might be a broken link in your email? That there’s a misspell in the subject line Stop fretting – send yourself a test email, check it thoroughly, and relax. Still worried? Send a test email to a friend or co-worker. Especially if they’re the picky type. 4) You didn’t check how your email will look on mobile devices. 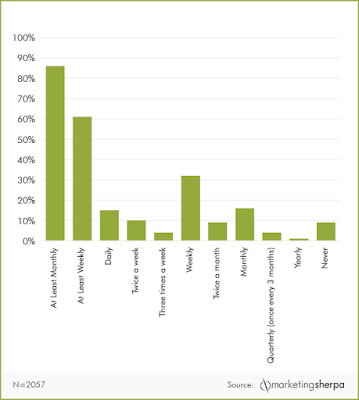 More emails are opened on mobile devices now than are opened on desktops. So when you send that test email out? Please – check it on your smartphone, or maybe a tablet. Or both. 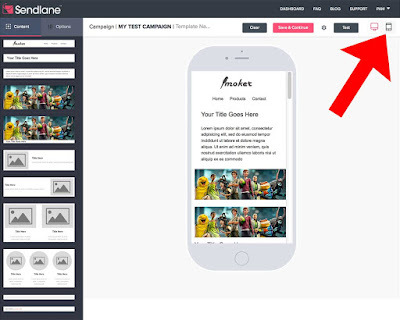 Sendlane™ lets you see how your email will look on mobile devices. But just to be 100% sure, it’s always a good idea to send a test email. You can do that from this same interface – the gray “test” button is just to the left of the desktop/mobile icons. 5) You removed the unsubscribe link. This is another legal no-no for email marketers. Fortunately, if you’re working with a reputable Email Service Provider, they’ll handle all this for you. We do. 6) You included a couple of HUGE (YUUGE!) images. 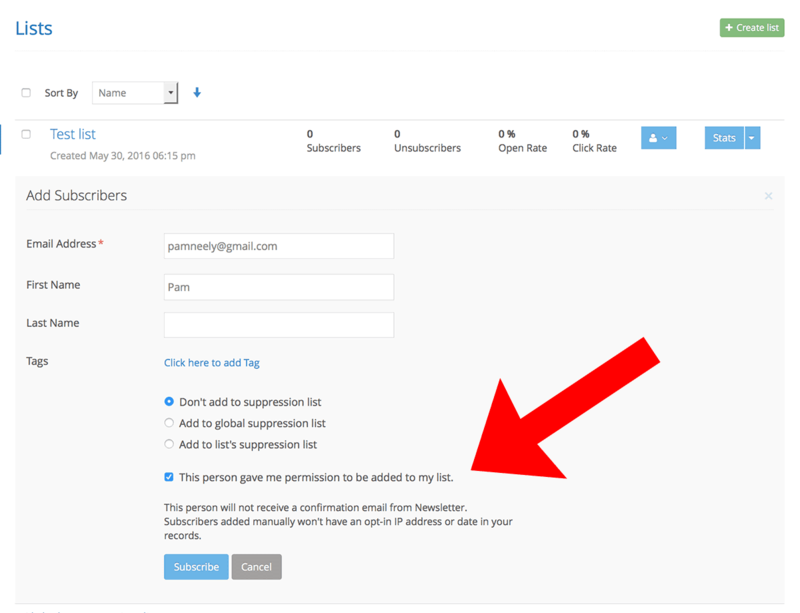 This is an honest mistake, but it can really put off your subscribers. Why? ‘Cause huge images (like bigger than 50K) can take a long time to load. People are crazy impatient now, so if they have to wait even 2 seconds to see your nice big images, they’re gone. 7) You’re sending emails too often. Have you been sending emails every day? That may be too much. Sure, some businesses can pull off daily mailings, but many can’t. And over mailing can wear out your subscribers fast. 8) You’re not sending emails often enough. Yup – this one’s the sister mistake of #7. You need to be sending out an email message at least once a month. Otherwise, your subscribers will forget who you are. Sorry to tell you that. Don’t take it personally. 9) Your emails are valuable and subscriber-focused. Remember – the inbox is a very competitive place. You’re competing with 30 to 300 other emails every day. What can you offer your subscribers that’s worth their oh-so-precious time? 10) You built a list, but you aren’t mailing to it. Oy vey – this one happens so often. It breaks my heart. If you’re doing this, please – pick two days every month to mail to people. Find a simple email template. Add some of the best content on your site to the email. Mail it. (After you’ve run through this checklist, of course). 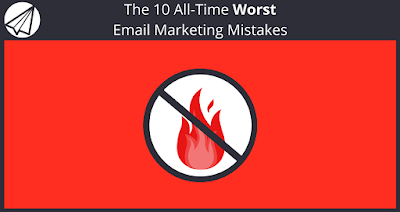 Know of any other email marketing mistakes you see a lot? Post a comment and tell us what they are.